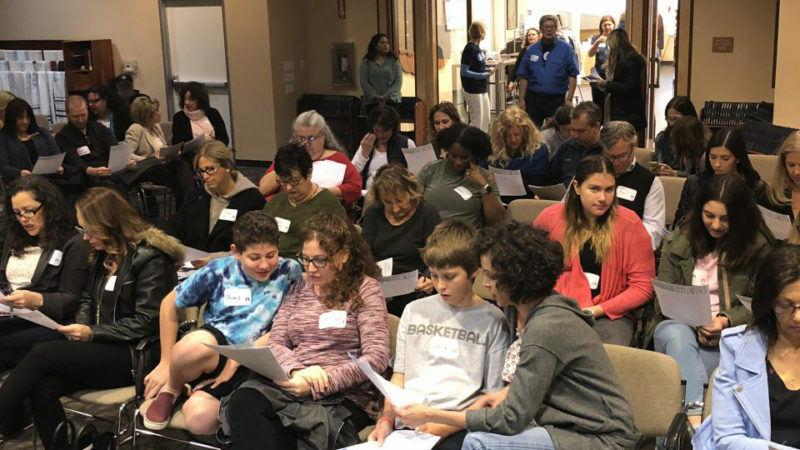 The Parent-Teen Mental Health and Wellness Summit realized a dream: to transform our synagogue, Congregation Or Ami (Calabasas), into a truly safe place for teens, their unique emotional journeys, and the parents who love but are unsure of how to protect them. It’s one thing to dream about transforming a synagogue into a safe and healthy place for teens; it’s another thing to actually prioritize the change-making process. Teens are learning real skills for resilience, stress management and anxiety reduction. Synagogue staff and faculty are training in new techniques for really seeing and hearing what our youth and their parents are saying and how to pass on concerns to appropriate caring professionals. Young people are getting the help they need to face the brokenness inside. Our Parent-Teen Mental Health Summit propelled us toward the next rung on our sacred ladder of caring: creating conversations between parents and teens, teachers and therapists, to address within the community the challenges we face. Headlined by Dr. Daniel Siegel, psychiatrist, author and director of the Mindsight Institute with UCLA, the Mental Health and Wellness Summit answered the question as to whether Judaism has a voice in this conversation with a resounding “yes!” We would have been happy with 75 participants; more than double showed up. The teen brain is wired to push them toward independence. When a teen and parents are struggling, it’s not hormones making the teen “crazy” but normal brain growth pushing them toward going out into the world. Dr. Daniel Siegel, expanding upon his Brainstorm research, opened our eyes to reframe this common parent-teen challenge. Wellness activities – meditation, yoga, coloring and the like – reduce stress and increase our facility with resilience. Sessions on yoga and meditation simultaneously deepened our own calmness and made us more open to learn and explore with our featured speakers. Jewish tradition speaks expansively about Shmirat Haguf v’Hanefesh (Caring for the Body, Mind and Spirit). When we speak openly about these Jewish values – as well as B’tzelem Elohim (that we each are infinitely valued, uncompromisingly equal and blessedly unique) and Chesed (that the whole of existence is built upon God’s unconditional, unlimited love of Creation) – we redirect our priorities toward Briyut (healing) and healthful loving. Parents hunger to understand how to differentiate between normal teen angst/stress/anxiety and the signs that their child is tipping toward dangerous levels of depression and mental imbalance. Local synagogues are filled with talented therapists, psychologists and counselors who are more than able and honored to offer expert workshops to answer tough these questions. Matching the two groups together leads to a type of learning that transforms both the families and the synagogue community. When leadership in a congregation speaks loudly and repeatedly about the mental health and wellness challenges our young people face, the discussion breaks down the walls of silence and gives others permission to continue the conversation. The prophet Joel articulated the challenge: that the old shall dream dreams but the youth shall see visions (phrasing by Jewish composer Debbie Friedman). The Parent-Teen Mental Health and Wellness Summit, an integral part of our synagogue’s commitment to teen mental health and wellness, pushed us to remember that when the old dream vinbrant dreams about our teens – undertaking learning and prioritizing culture transformation, the visions our youth will see can be healthy, heartfelt and hopeful.